Nina Fay Rolph (nee Adams), 84, of Monroe, Ohio, entered eternal rest while at her home on Wednesday November 28, 2018. Nina “Fay” was born on September 2, 1934 in Fincastle, Kentucky, to her parents James Nelson Adams and Della Mae Alexander Adams. Fay was the seventh of their ten children; Cora, Anne, Betty Thelma, Sue, Bill, Robert, Lawrence, and Donald. Fay met her sweetheart Charles Allen Rolph in Covington, Kentucky while she was working as a waitress in 1951. They later married on December 22, 1952 while still residing in Covington. Together they had five sons, Charles “Chuck” Rolph wife Candy (Shumaker) of Springboro, Gregory wife Judy (Rudd) of Middletown, Jeff of Middletown, Kevin of Monroe, and David wife Christy (Schwarz) of Monroe. During their 57 of years of marriage, they lived in the Covington area, Middletown, Springboro, and Monroe. They labored in love together running several successful independently owned family businesses. Fay’s true joy was in raising her children and spending time with her grandchildren. Fay was an active member of her church community, The Church of Jesus Christ of Latter-Day Saints. 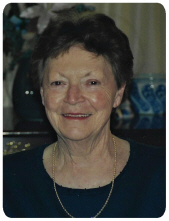 She was a devoted member and acted as their women’s Relief Society President for numerous years, the Compassionate Service Leader, the Dayton Area Primary President, the Dayton Area Young Women’s President, and Activities Chair Person. She was a beloved member and would often spend time with the elderly and care for the less fortunate in her various roles. She instilled a love of the gospel and service into her children and extended family. She and Charlie helped to build the existing church when it was erected in 1960 located on Central Avenue. Fay had a quick wit and a hunger for learning. After raising her family and becoming a grandmother, she went back to school to obtain her GED from the Middletown Adult Education program and even went on to earn a degree as a License Practical Nurse. She was employed as a nurse by Otterbein retirement home for twelve years before retiring. She loved to laugh about taking care of patients who were younger than her. She was a gentle heart and passionate caregiver. She was proceeded in death by her parents, eight siblings, her husband Charlie, and her eldest granddaughter Amy Rolph. She is survived by her five sons, 10 grandchildren, and 11 great grandchildren. A beloved sister, wife, mother, and grandmother who has served and loved her family and community with her whole. While she will be deeply missed, we celebrate her restored health and eternal rest she has entered. Please join us in celebrating her joys, laughter, love, and life at the visitation services Monday, December 3, 2018 from 6:00 p.m. – 8:00 p.m. at Wilson-Schramm and Spaulding Funeral Home located at 3805 Roosevelt Blvd Middletown, Ohio 45044. The funeral services will be held at The Church of Jesus Christ of Latter-Day Saints on December 4, 2018 at 11:00 a.m. located at 4930 Central Avenue Middletown Ohio. Interment to follow at Monroe North Cemetery 401 N Main Street (Cincinnati-Dayton Rd) Monroe Ohio 45050. To send flowers or a remembrance gift to the family of Nina Fay Rolph, please visit our Tribute Store. "Email Address" would like to share the life celebration of Nina Fay Rolph. Click on the "link" to go to share a favorite memory or leave a condolence message for the family.